The countdown is on for new electric trains to commence passenger service in Auckland. The first train is about to roll off the production line at Construcciones y Auxillair Ferrocarriles (CAF) in Spain. 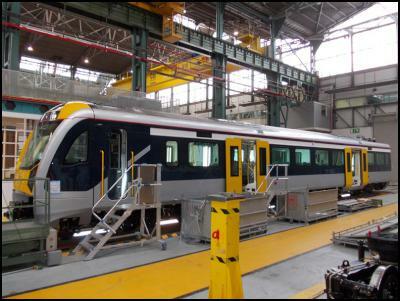 CAF is building a fleet of 57 three-car high-speed train sets to carry passengers on the Auckland suburban rail network. These new state of the art trains have been designed to meet the specific needs of Aucklanders and feature the latest in terms of safety, comfort and reliability. The first train is expected to leave Spain in June, arriving here in early September. 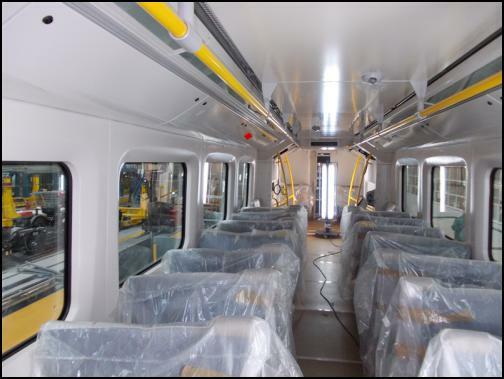 Between September and April the new trains will be thoroughly tested and used for driver training before going into operation once there is a sufficient number to run a commercial service. And for the first time we can reveal the seating layout for the trains. This comes after Auckland Transport consulted with user groups (including the mobility impaired and cyclists) on what they need from the trains. Auckland Transport Chief Executive David Warburton says, “The input of various interest groups has helped with the final layout. These trains are designed specifically for the needs of Aucklanders. The three-car trains carry up to 375 passengers, around 100 more than the current trains or an increase of over 35 per cent. All cars will have a variety of seating arrangements. The longitudinal seating will be Priority Seating for people with mobility issues, seniors and parents with children as well as those travelling with large items like bikes and cases. There will be four sets of flip up Priority Seats inside the middle (or trailer) car where bicycles and wheelchairs can be secured for travel. Priority seating is great in theory, but I stood on the train this morning, heavily pregnant holding the hand of my two year old son, and none of the able-bodied school children or men in the priority seating area offered a seat. The Veolia employee walked by twice without offering to help.